Your child will love these 2 middle grade books! They are part of this new series of biographies for young entrepreneurs: From an Idea to Disney and From an Idea to Nike. 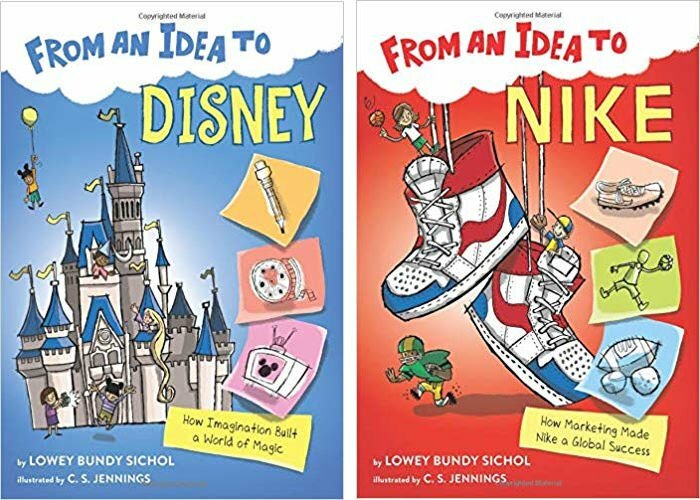 The From an Idea to… series by Lowey Bundy Sichol, MBA, is the world’s first entrepreneurship biographies for kids. These books focus on businesses that are of high interest to middle graders, including Disney, Nike, Google, and LEGO! Lowey is a renowned MBA case writer, and her studies have been read by business school students around the world. As her children grew older, she realized they made fascinating stories to share with her own kids. A local indie bookseller and school librarian inspired her to turn these stories into a book series. This series introduces young readers to business and entrepreneurship. In turn, they inspired them to become entrepreneurs, business leaders, and problem solvers themselves through grit and passion. From an Idea to Disney is a behind-the-movie-screen look into the history, business, and brand of the world’s largest entertainment empire. With humorous black & white illustrations throughout, learn about the company behind the world’s favorite mouse, Mickey! Today, the Walt Disney Company is the biggest entertainment company in the world with theme parks, TV shows, movie studios, merchandise, the most recognizable cartoon character in the world, Mickey Mouse. But a long time ago, brothers Walt and Roy Disney started out with just an idea. Find out more about Disney’s history, the business, and the brand in this illustrated nonfiction book! Find out what Walt first intended to name his famous mouse (hint: It wasn’t Mickey! ), discover behind-the-scenes magic of how Walt Disney World is run, explore the ways the Disney expanded its brand from a little mouse into media, merchandise, and more! If you know me, you know that I am a huge Disney fan. If I could afford it, I’d be at WDW at least once a year. The book From an Idea to Disney really gave me a lot of information that I didn’t even know. I did learn a lot about Walt Disney at the Walt Disney Family Museum in San Francisco, and I highly recommend that you visit if you are ever in that area. From an Idea to Disney shows that failure is a part of life. Walt Disney had to start over many times, but he had an idea that he wouldn’t give up on. People doubted Walt many times thinking that his ideas would not work. He risked so much to make the first full-length animated movie SNOW WHITE AND THE SEVEN DWARFS. After Walt died, Walt’s brother took over, but he died soon after. From 1971-1984, Disney was in jeopardy of failing and no new movies were made. Can you imagine if the Disney company had gone under?! In 1984, a new CEO was hired, the Disney brand exploded, and the movie that sparked the “Disney Renaissance” was released: THE LITTLE MERMAID. I really think you and your child will enjoy this book. It teaches some great lessons while giving really interesting tidbits about Walt Disney and what the Disney brand is all about now. Find out where the name Nike came from and how the famous swoosh became the signature logo. Learn about the company’s first marketing campaign with a star athlete (hint: It wasn’t Michael Jordan! ), explore the ways Nike expanded marketing from running to basketball, soccer, golf, and beyond! From an Idea to Nike is another really inspiring book for your middle grade student. I had no idea how Nike began nor the amount of work that its founder Phil Knight put into making his business idea a reality. As in From an Idea to Disney, business concepts are explained in a way that children in this age bracket can understand. This book is extremely inspiring and teaches kids that everyone fails, but it’s the ones who keep trying who eventually succeed. And who knows? The successes they strive for might be an inspiration to kids someday too! Lowey Bundy Sichol is the author and creator of From an Idea to…, the world’s first business biographies for kids. She is also the founder and principal of Case Marketing, a specialized writing firm that composes MBA case studies for business schools. Her MBA case studies have been published by Pearson and are read by business school students all over the world. With over 20 years combined experience in marketing, brand management, and writing, Lowey is the force behind the From an Idea to… series, a movement that introduces business and entrepreneurship to children. 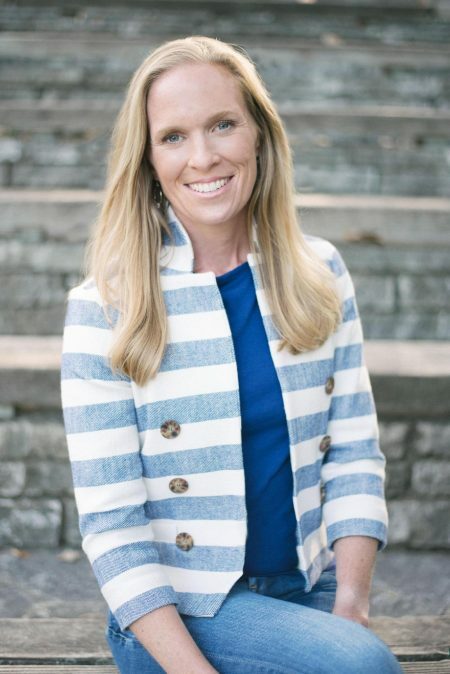 Lowey received her MBA from the Tuck School of Business at Dartmouth and her BA from Hamilton College where she played varsity softball and women’s rugby. When she’s not writing, you can find her throwing a ball, shooting hoops, or along the shores of Lake Michigan with her husband, three children, and two big goofy dogs who like to climb trees. Look for her online at loweysichol.com. Lowey will be visiting schools and speaking at conferences across the country throughout 2019. The third and fourth books in the series, From an Idea to Google and From an Idea to Lego will be published in July 2019. One of my followers will win these books. This giveaway is open to the US only ages 18+ and is void where prohibited. The sponsor will ship the prize to the winner. 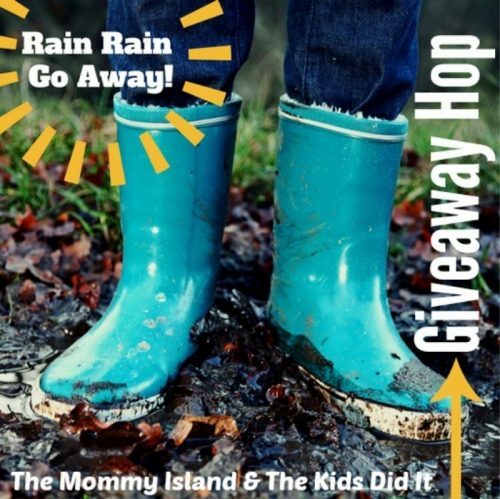 By entering this giveaway, you’re agreeing to the privacy policies of this blog. Entrants need a profile picture on at least one of their social media accounts from which they’re entering, or your entry will be void. The winner has 48 hrs. to claim the prize or another winner will be chosen.